14K White and Rose Gold Double Row Floral Wedding Band in 5.5mm width. How better to celebrate a love that will always be in bloom than with a wedding ring engraved with perpetually blossoming flowers? This 14K Rose and White Gold Double Floral Band Wedding Ring combines a double dose of a charming floral motif with a sleek, modern touch, perfectly combining the past and the present in a way that allows this ring capture the beauty of a love that's alive and thriving. 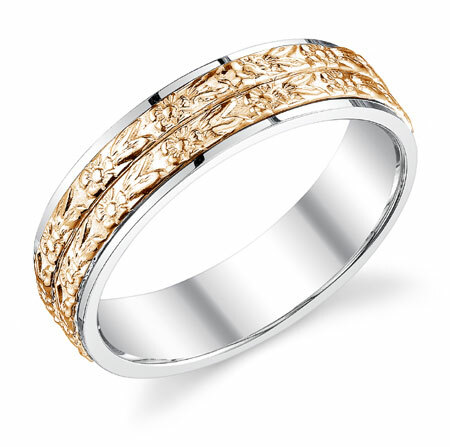 Two rows of delicate floral motifs are the feminine focal point of this striking wedding band. Carved in warm yet soft rose gold, these six-petal flowers and leaves are a sweet and sophisticated symbol of the love that has caused your heart to blossom. These patterns wrap around the wedding band in unbroken fashion, creating a picture that your bond is not only flourishing, but also that your commitment and affection will never come to an end. Gleaming, smooth edges of 14K white gold offset these floral motifs, providing a cool backdrop that allows these designs to pop. This elegant two-tone style has enduring grace and charm, making it a piece that will be cherished for a lifetime. It's a lasting representation of a love that's in full bloom. We guarantee our 14K Rose and White Gold Double Floral Band Wedding Ring to be high quality, authentic jewelry, as described above.